Individual therapy, as Jung reminds us in the quote below, has a great deal to do with working with the psychological complex, in all its forms. The term “psychological complex” used in a depth psychotherapy sense is now widespread in our culture. For instance, just recently, a pundit was writing about “Canada’s superiority complex“. But few realize that it was Jung who discovered the psychological complex, and first applied it to individual therapy. He tells us here exactly what complexes are. There are certain very powerful emotional experiences of which we carry an inner image, in Jung’s terminology. These can stem from early life, or from later times as well. These “images” can involuntarily replay for us whenever we encounter a situation that is similar to the original experience(s) that created the psychological complex. 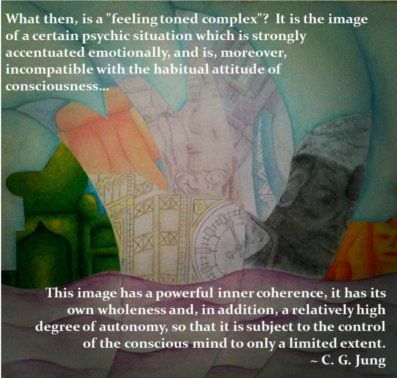 For Jung, complexes essentially have a “mind of their own”. How we are when we’re in the grips of a complex can have little to do with how we might feel, think and deal with things when we aren’t in its grip. Often, a psychological complex can be more or less in the driver’s seat [e.g., think “road rage”]. The difficulty with complexes is that, more often than not, they are not totally under the control of the ego. This means that, although we may wish to overcome them, or move them out of our lives, it is not a simple matter of “whupping up” the will power to do so. No matter how much will power or concentration we may try to exert, it is likely not to be enough. What Can We Do About Complexes? To really start to resolve a complex, it is essential to explore its roots in the unconscious mind. It’s only when we get to the conflict or the wound that is at the heart of a complex, and make that wound, and the feeling around it into consciousness, that we can begin to take the energy out of the complex, and begin to have an increased capacity to avoid being completely sidelined by it.